When Nikola Tesla started tinkering with radio waves in the 1890s, nobody could have predicted the influence his work would have on the world. Nobody, that is, except for Tesla himself. His ambition was to harness radio waves to transmit electrical power wirelessly over long distances, ultimately supplying power across the planet. He also realised that the same principles could be applied for the purpose of communication. Whether it was Tesla or Guglielmo Marconi who invented the first practical radio system is open to debate (and was the subject of a patent lawsuit between the two) but the global scope of Tesla’s vision laid the foundation for wireless communication as we know it. If Tesla’s vision sounds familiar, that’s because so much of the technology in our daily lives would simply not be possible without wireless communication, including the Internet of Things (IoT). As you sit reading this, you are probably within range of Wi-Fi, Bluetooth, cellphone, TV, radio and positioning satellite signals – all invisible and all essential. As our insatiable hunger for ever larger volumes of data has grown, wireless technology struggled for a time to keep pace. But has it reached the tipping point where it can ‘do it all’? Can it now meet the demands of a modern residential estate environment to provide reliable connectivity for its residents and, crucially, for its security systems? Helping us find the answers will be Marco de Ru, commercial manager at MiRO Distribution; Nick Ehrke, sales director at Radwin; Riaan Graham, sales director at Ruckus Networks sub-Saharan Africa; and Teresa Huysamen, business unit manager at Duxbury Networking. As is the case in almost every environment, Wi-Fi has become the de facto standard for wireless communication, including estates. Governed by a set of IEEE (Institute of Electrical and Electronic Engineers) standards referred to as 802.11, Wi-Fi has been around for twenty years and has been updated several times, mostly to allow for higher speeds. Originally operating in the 2,4 GHz licence-free frequency spectrum and providing speeds of up to 11 megabits per second, Wi-Fi now has several versions running at different speeds and frequencies, but most commercial-grade devices support both 2,4 and 5 GHz, with speeds up to several gigabits per second. But ADSL running on copper cable, and even more so fibre, are generally seen as being faster and more reliable, so why would an estate choose a wireless solution? Marco de Ru: The obvious reason is the cost and hassle you’ll save by not having to dig trenches and lay copper cable or fibre. At the bits-and-bytes level, IP-based wireless systems like Wi-Fi use the same data packets to transport information as a cable-based Ethernet LAN, so it can be used for anything from voice communication to Internet traffic, as well as, of course, video. In the last five years the capacity of wireless technology to transport data has increased tremendously, from 80 Mbps at best in those days to 1 Gbps or more today. Throughput is definitely not an issue, in fact you can get more speed from a wireless link than from a conventional 100 Mbps LAN cable. Nick Ehrke: Wireless offers a clear advantage in terms of the time to deploy, and there is no trade-off in terms of availability. An estate can consider wireless connectivity viable not even as an alternative but as a first choice for broadband connectivity. It can provide the capacity and reliability to service residents’ Internet connectivity needs as well as being trusted to provide camera feeds to security operators in situations which can sometimes be a matter of life and death. The frequency spectrum we typically see estates use is 5 GHz, which allows us to achieve a point-to-point range of up to 120 km – more than enough for any estate. Our equipment uses advanced techniques such as multipath propagation, OFDM (orthogonal frequency division multiplexing), MIMO (multiple-in, multiple-out) antennas and others to ensure that the wireless links are as robust and reliable as possible. Riaan Graham: When it comes to new builds in particular, gone are the days of having to pull cable and do all of the rest. 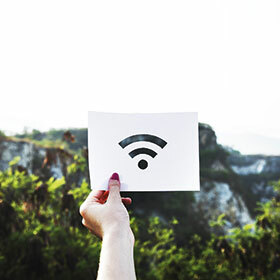 Of course you will need fibre into the boundary of the estate, but all outdoor and in-house connectivity can be serviced by Wi-Fi very successfully. Nowadays, it’s more than good enough to do voice, data and video. Six or seven years ago the best you could get out of a single access point was anything from 20 to 54 Mbps maximum, whereas today we’re getting around 2 Gbps on a single Wi-Fi access unit. That means there’s more than enough capacity to service utility-type services like CCTV monitoring in addition to voice (which doesn’t have high data requirements anyway) and use for typical ISP connectivity such as streaming services. The way we manage the traffic has also improved significantly. As an example, we do all of the stadiums for the Indian Premier League and some of them service 90 000 people, all of whom expect to get decent Wi-Fi access. Teresa Huysamen: On a technical level, since wireless links can create a transparent IP bridge to pass any kind of IP traffic, they can and frequently are used for voice, video and data traffic. They meet the requirements for real-time communication, and while latency will depend on many factors including the wireless hardware itself as well as RF interference, there are many wireless links being used to service voice traffic which requires low latency. Despite how capable Wi-Fi is these days, there is no getting away from the fact it relies on electromagnetic radiation the same as any other wireless signal does. Anything that can affect that signal, such as another source of radiation or an electrically conductive object (for example metal) in the transmission path, is a potential source of interference. We all know the risks posed by criminals jamming signals, but other, more mundane factors include other signals operating at the same frequency, bad weather conditions and motor vehicles. How confident can you be that your signal is solid? Marco de Ru: Wireless is open to interference from external sources, but there are lots of smart technologies built into today’s wireless products. These include active filters whose RF filter frequency moves around as the wireless channel might change. It is also not exposed to the long cable runs of copper in the ground where you can pick up ESD (electrostatic ­discharge) which can damage equipment. On the cybersecurity side, wireless systems nowadays use 256-bit encryption. Weather does not have an influence because of the frequencies used, only at much higher frequencies would it be a problem. As for motor vehicles passing in front of a radio, you would typically not mount them low enough for that to be an issue, and even if it was the worst effect would be a drop in speed, not a complete loss of connection. In terms of uptime, wireless systems today can guarantee carrier-grade uptimes, by which I mean 99,999%. Nick Ehrke: On the issue of jamming, you must understand this is not like your car remote getting jammed in a parking lot. The system we’ve built is telco grade, and to meet these standards the wireless link must to all intents and purposes be unjammable. Yes there can be interference, but our radios integrate a number of techniques that overcome jamming or other signal interference, and their signals can’t be intercepted or hacked. Our equipment is built for situations where you cannot sustain a loss of revenue, reputation or loss of life. It can operate in the most trying conditions in the world, be it rain, sleet, snow or sandstorm. As with any other element of a security infrastructure, proper planning of a wireless network is vital for it to be successful. There is no single piece of kit or solution that will fit every estate’s needs or budget, so what must you plan for, and how? Nick Ehrke: Solutions will always be based on requirements – what cameras are installed, how many, and their location. You can’t cheat the physics, and the radio planning tool we’ve got gives you higher than 95% accurate predictability before you go on site. So let’s say you’ve got ten PTZ cameras in five locations that you need backhaul for, each camera requires 10 Mbps in the uplink and maybe 1 Mbps downlink. Taking this specific uplink and downlink requirement, as well as the distances involved into account, you can do an empirical calculation to plan your network. After planning all that is needed is to do a site survey to confirm the planning and the exact heights of the radios and the cameras, cable run lengths, where the subscribers (customer premise equipment) will be installed, etc. Radio planning really removes the guess work. Another reality is the need to plan for power outages. We’ve designed a cabinet called the Smart-Node to give our radios a higher level of redundancy and uptime, so we can provide an all-in-one power and communication cabinet that estates or system integrators can use. Riaan Graham: You need to understand what the needs of the estate are. Typically in a security scenario you would build an outdoor Wi-Fi environment, making sure you’ve got sufficient coverage throughout the estate wherever cameras are installed. You would typically use 5 GHz as a carrier frequency if you have multiple sites you want to interconnect, and then 2,4 GHz for local connections to an access point. Then because the signal is there anyway and there’s no way the CCTV will take up all the available capacity, you can have resident access on the same infrastructure using a different SSID, so they can have continuous coverage whether they’re at home or walking their dog in the park. This dual function makes wireless very attractive versus fixed cable. Teresa Huysamen: Wireless links should always be properly planned and designed prior to deployment, and external factors such as weather and physical obstructions should be considered beforehand. A radio’s tolerance to line-of-sight obstruction is partially frequency dependent. If we assume most deployments are using the 5 GHz band, then line-of-sight is generally recommended. It is possible for links to be deployed non line-of-sight, but it is difficult to guarantee performance in such scenarios, and therefore should be avoided when using 5 GHz. The equipment should be deployed with enough clearance that any vehicle or other potential obstruction does not obscure line-of-sight. Similarly, bad weather should be considered during the planning phase. Any planning tool should consider the rain fade factor of a link and plan for sufficient fade margin. If planned correctly, links will be resilient to weather. Once again, this is frequency and product specific, as different frequencies are more susceptible to weather than others. However, 5 GHz is a comparatively low frequency and handles weather far better than some higher frequencies. If we assume that most estates do not exceed 5 km across, and any link in the estate is only up to 5 km, the capability of 5 GHz radios can cope with bad weather when using suitable antennas. Marco de Ru: Quality of service (QoS) is an important factor to consider as it can affect performance of the entire wireless network. If you have the right equipment you can set priorities for different types of traffic; depending on the application you might want to give voice top priority, or in the case of surveillance, video is the most important. One of the brands we see working very well with video due to its QoS technology is LigoWave, which you don’t need a lot of experience to get up and running. Their point-to-multipoint solutions are very cost effective and can deliver about 500 Mbps per base station and covering a region of up to 4 to 5 km radius. Depending on the layout, e.g. if there are lots of trees or tall houses, you might want to work around that and place base stations in strategic places to provide optimal line-of-sight to the cameras. You have a small radio mounted next to each camera, and then a base station mounted at the guardhouse or wherever you want to get the video feed to (where your NVR is situated). Most of the wireless brands we sell come with central management software, so if you have multiple radios in the field you can manage them centrally and set the QoS and push that setup out to all radios instead of setting them up individually, reducing installation and setup time. It can be tempting to believe that wireless offers all the benefits of a cabled network without any of the drawbacks, but then every estate would be ripping out all their cabling by now – or better yet, sparing the effort and just leaving it in the ground to rot. Although Wi-Fi is certainly gaining traction, there are a couple of things hindering its adoption. Riaan Graham: Uptake is still in the early stages when it comes to new builds. If you look at a large construction project for a gated community, the last thing these construction companies tend to think about is Wi-Fi connectivity. Hopefully that will change rapidly. Cable reticulation requires them to dig holes and so on, whereas Wi-Fi is simple, cost-effective and unobtrusive. We see a lot of wireless technology going into retrofits, but I would really like to see the new estates take up the technology as part of their initial build costs. When you consider that you could pay anything from R1,5 million upwards for a property in a gated community, the cost of installing a Wi-Fi network is really negligible. We are putting in a lot of effort to educate the construction guys to think about their environment slightly differently, and we are making inroads in this regard. Nick Ehrke: In the South African context, to a large extent estates have been built around maximising square meterage for the developer, and no planning was done upfront for broadband or CCTV requirements. Nowadays there’s more of a focus on lifestyle so this is changing, with estates looking to invest in security to provide a safe and secure environment. But consideration must be given to the advancement of camera technology and software analytics. To be truly effective, high-definition CCTV has to be deployed, and this requires high bandwidth especially in the uplink. ADSL is not suitable as an example as it was designed around downlink and as a shared, best effort service. With multiple cameras you need cost effective backhaul, but reliability is key. To trench or do air fibre can be a risk because the cables can be cut, so yes, there’s much more of an uptake in terms of wireless carrier class equipment to meet these safety and security requirements. How wireless compares in terms of cost varies from estate to estate. Estates should always look at all technologies available to meet their requirements, for example fibre is a great product for backhaul, but consideration must be given to the cost of trenching. System redundancy must also be a consideration. If proper planning is done, cost comes down to an empirical calculation and each technology’s pros and cons can be evaluated fairly. An option could be to use wireless initially or for specific applications (because you need immediate access to cameras and access control as an example), and later trench fibre and use the one medium to back up the other. Marco de Ru: We see that there’s definitely an increase but we still find that people’s lack of technical knowledge is a slight barrier. What we do on our side to help guys like the system integrators to understand the technology and get their hands on some gear, is we have started with an introductory, one-day ‘zero to hero’ wireless training course. It covers everything you need to know, from the theory of wave mechanics all the way to the factors you need to consider before you actually install a wireless network. This is a very quick way to upskill yourself and take that to market. As an integrator, to offer a wireless solution is really a very attractive thing for the end-user because you are probably going to be able to deliver something at a better price and in a shorter timeframe for installation – what might otherwise take a month or two to do you can do in a week. Wireless is definitely a future trend, but I think people in the surveillance industry have had bad experiences in the past, like in its infancy when Wi-Fi was just about connecting a laptop to an access point. Nowadays with specialised outdoor wireless devices that whole scenario has changed, and as soon as people can just realise that I’m sure the uptake will increase more.